We've settled into our home for the month of December at Sunset Isle RV Park. This is a delightfully funky park on an island (Key in local lingo) in the Gulf of Mexico. We are surrounded by palm trees and tropical plants. We even have our own citrus tree behind the bus. There is an interesting community of travelers here, with music at night in the clubhouse and a communal Thanksgiving dinner yesterday featuring smoked turkey from the owners' smokehouse. Back where we left off with our previous post... Our stay at Huntington Beach State Park continued with Lucie and I working every day from our RV, Lucie on her three online graduate courses and me on Google and Haiku accounts for the K-2nd graders at St Albans City School. We took time on Friday to walk from the campground to Brookgreen Gardens, a beautiful outdoor sculpture museum situated among formal gardens in what used to be a S. Carolina rice plantation. There were many pools with blooming water flowers. On the walk in we saw wildlife. and sometimes on the beach. Finally on Monday it was time to go. We headed south through Georgia stopping for the night at a Flying J truck stop just before the Florida border. Lucie's office while we are driving down the road. Tuesday we crossed to the west coast of Florida in the rain. About 8 miles from our destination we had to pull over because a tire on the car dolly had self destructed. 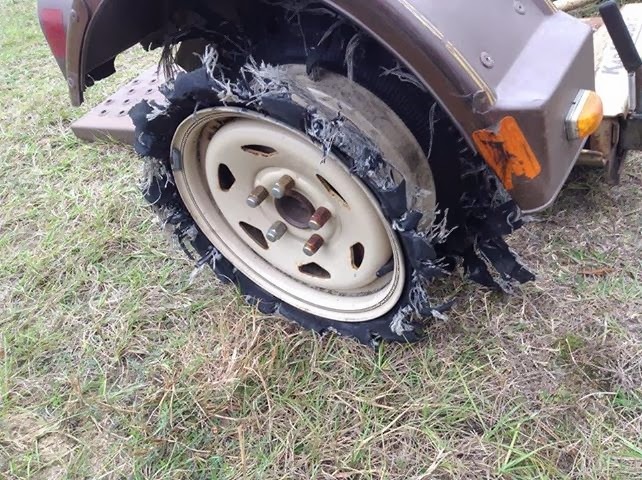 We ended up meeting two very nice locals as we determined that there was no replacement tire to be had in Cedar Key and we found a place to stash the dolly while we completed our journey with Lucie driving the car while I drove the RV into the campground at dusk. 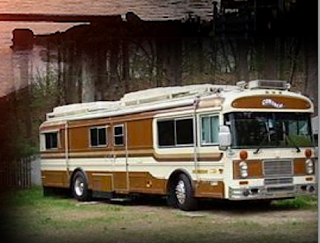 I had heard about Sunset Isle RV Park on line from a group who call themselves Nu Rvers, people who are working from the road. So far is has proven to be a good choice. Yesterday, Thanksgiving, we enjoyed a wonderful feast where the campers here all brought dishes to share and the owners smoked a turkey in the smokehouse that is visible out the front window of the RV. In the evening people gathered in the club house where the musically talented among us played their instruments and we all sang along.